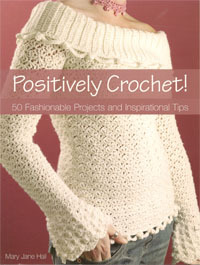 Crochet Uncut > Reviews > Book Reviews > Positively Crochet! When Positively Crochet, by Mary Jane Hall, was first published, the top on the front cover immediately drew my attention. The top consists of shells, a ribbed off-the-shoulder neckline, and flared sleeves that cover the base of the hand. Nevermind that I can’t wear a top like this but I immediately thought of my sister Darlene when I saw it. The book immediately went on my Amazon wishlist until I could afford it. I now have the book and while I haven’t yet made anything from it, I love looking through it and making plans. Positively Crochet contains 50 projects and is interspersed with helpful hints and words of encouragement from Mary Jane. The projects include tops, scarves, hats, bags, belts, accessories, shrugs, and more. Patterns are contemporary as well as a bit retro providing a range of techniques for today’s fashions. Most of the patterns are for adults but a few patterns include child versions along with an adorable capri outfit for a little girl. Not every project in the book is something I’d make or wear, but there are plenty of designs available to tantalize you no matter what your style. Directions and diagrams are clear and well written while the hints and words of encouragement cover a variety of skills and techniques.